I have the hardest time at the farmers market. Everything looks so good that I sometimes tend to, ahem, buy too much. Berries can especially be a challenge because you really only have a small window of opportunity to use them at their peak. 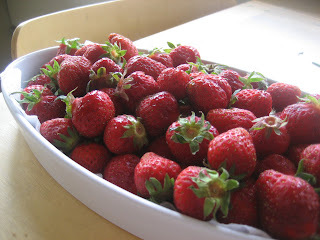 This week at the market, the strawberries were luscious. About the size of the tip of a thumb and smaller, they were sweet and red all the way through. Their perfume wafted from the stand as I approached. I just couldn't resist buying a couple quarts. When we've eaten all the fresh berries we can, some sort of baked fruit thing is our favorite way to finish off the rest. 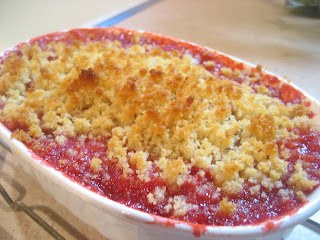 This strawberry crisp is from Fine Cooking issue 72. It was an unusual recipe (to me, at least) in that the crisp topping is made from buttered bread crumbs. The author likened the finished flavor to "buttered toast with strawberry preserves." The topping turned out delicately crisp which was OK but not fantastic. It did taste a little like toast. I much prefer a classic crunchier crisp topping like the one from Fine Cooking issue 43, so I'll probably not make this again.